Winter has settled in around the country and cold temperatures with snow often bring trouble to your home. Although your entry doors are designed to protect your home against blustery winds and snow, there are several problems that may arise this time of year. Below you’ll find some of the most common problems that arise with entry doors during the winter. This is one of the most common winter weather woes for entry doors. When your door binds in the upper corner of the jamb, it’s a result of the door pulling down at an angle from the top corner. Changing weather can cause the door or its frame to expand and contract, which causes it to get stuck. This is especially true when you’re dealing with an authentic wood entry door, which is notorious for presenting a variety of issues in terms of maintenance and performance. Other causes for a binding door include: stripped screws giving out, or the weight of the door pulling down on the opposite corner. This causes the door to tilt forward as the top corners of the door tilt and bind on the jamb. Keep in mind that the space between the door and the jamb—otherwise known as the reveal—should be about the thickness of a nickel. This will help prevent binding during the wintertime. Now that you know what causes binding on your door, you might be wondering how to fix it. First, replace the old screws with new ones. Do this as soon as you notice that the door is starting to catch as it opens and closes. When replacing the screws, keep them slightly larger than the old screws that you just threw away. A good size for replacement screws is 3”. You’ll want the screw to penetrate all the way through the jamb and into the stud framing around the jamb. While you drill, decrease pressure as the door begins to lift up and move back into the correct position. When replacing with a longer screw, the idea is for the screw to reserve more balance for the swing of the doors. Remember that you’ll need to drill pilot holes that are slightly deeper than the current holes. The goal is for the screws to relieve the pressure and help the door sit plumb inside of the frame. During the wintertime, screws may come loose from your door. Like door binding, this is also caused by changes in humidity and temperature. While this may not seem like a big deal, it can cause several issues. Loose screws can cause your door to sag and not fit squarely within the frame. It can also cause the door to rub or stick against the frame. While loose screws can make for a frustrating experience with your entry door, there are several ways to fix this situation. The first course of action is to simply tighten the existing screws, but if the screws are stripped you may need to drill new pilot holes for new screws. Beyond tightening the screws, the next step is to replace the existing screw with one of a larger diameter. If that doesn’t work, then try using a dowel. You can glue it with dowel glue into the screw holes, allowing them to dry completely. After the glue dries, drill new pilot holes and proceed with installing the new components. The last thing any homeowner wants is a door that stays open during the winter---drafty doors can account for 11% of energy loss in the home [PDF]! When a door won’t stay open, this is yet another sign that the door isn’t fitting squarely within the frame. The door jambs are likely not standing vertical and leaning toward the left or the right side. One fix is to try re-drilling holes for bigger screws. Another option is to create a shim which can be placed behind the screws in the hinges. You’ll need to know where there is a bind or where the door pulls from the hinge, which is either the top or the bottom. You’ll then place the shims to even the swing of the door. Ta-da, your door should now stay closed! When the door latch misses the strike plate, this typically means that the strike plate is misaligned. Even a latch that is off by a fraction of an inch can cause the door to not close properly. For the door to latch properly, the small metal plunger on the side of your door must fit neatly into the plate that’s attached to the frame. If you discover the door latch is missing the strike plate, first be warned to not force the door shut. This can cause sticking or even binding! 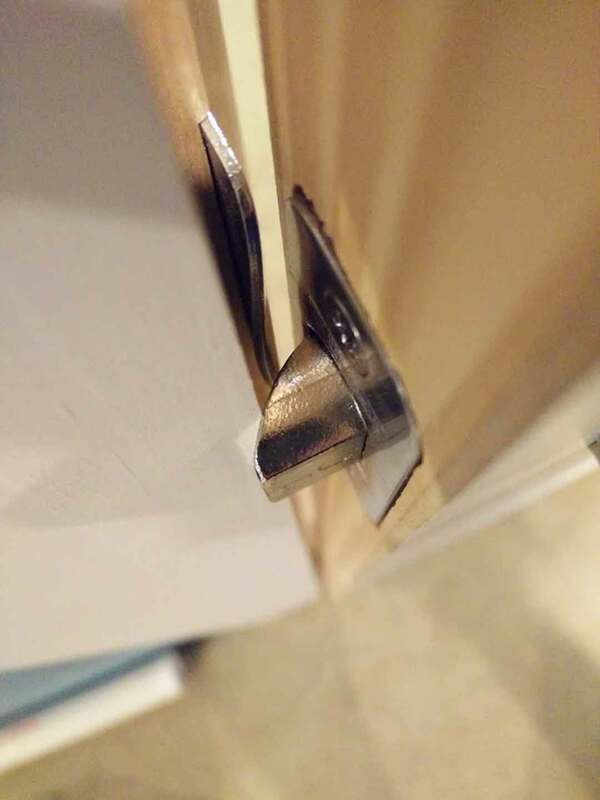 When the latch is missing the strike plate, it’s probable that the parts on the door or the jamb have loosened, causing it to come out of alignment. If this is the case, you can simply turn to adjusting the strike plate so it properly aligns with the door. Cold and wet winter weather can put a damper on your entry door---and it can even ruin its appearance! Moisture from winter weather can cause your door to fade and lose its vibrant color. While losing color on our entry door is a real drag, the good news is that it’s preventable. For an existing entry door, there are numerous treatments you can apply that will protect a wood entry door from moisture. For the long-term, the best option is to invest in an entry door that’s made of fiberglass material. Fiberglass is resistant to moisture damage and it’s treated to prevent fading. This means that you’ll have a door that looks beautiful throughout all seasons, no matter the weather or climate! Exciting, right? The purpose of weather stripping is to block drafts from the outdoors. If you feel drafts around your door, install new weather stripping to help save more energy this winter. If you’re worried about installing weather stripping, the good news is that it doesn’t require a lot of skill to get the job done. If this option is too complicated or time-consuming, you can buy peel-and-stick weatherstripping from the hardware store or even Amazon. The application is just about as easy as it sounds! Few things are more annoying than a squeaking door, and it’s a sure sign that winter has arrived. The key to this fixing this winter woe is giving your door a little bit of lubrication. You can silence a squeaky door by using petroleum jelly that works its way into the hinge and adheres to it, so it won’t make a mess like other lubricants. When applying the petroleum jelly, remove the pins first so it can get down into the holes. 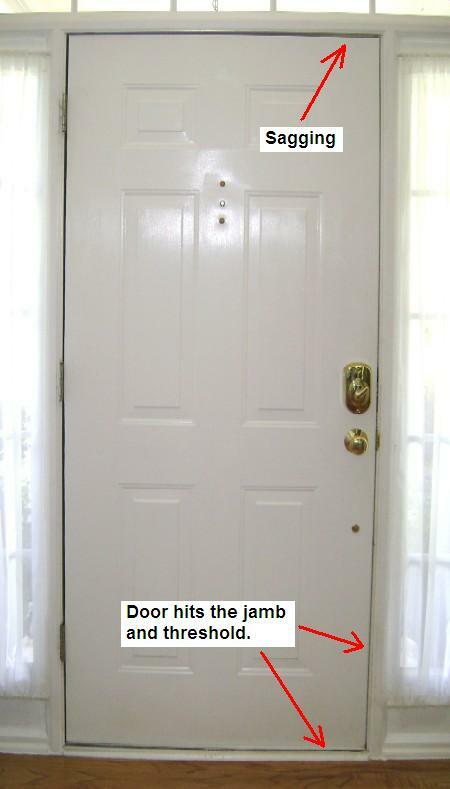 Any pin that allows the door to swing should be removed, lubricated, and replaced. Ahh, silence at last! If your door just won’t stay shut, it may be a result of loose hinges. It’s funny that something so small can cause such an issue for your front door! Tightening the top and bottom hinges can help solve this problem, but don’t strip the screws—this may loosen the door even more. Another area to analyze for this common winter problem is the strike plate. You might find that the strike plate is misaligned, which is causing a gap between the door and the frame where it won’t latch. If this is the case, move the strike plate up or down to place it in the correct position. It’s the time of year where winter weather can compromise home security when it comes to your door locks. Locks can become almost sluggish in cold weather due to moisture. Sometimes, locks can even freeze in place! 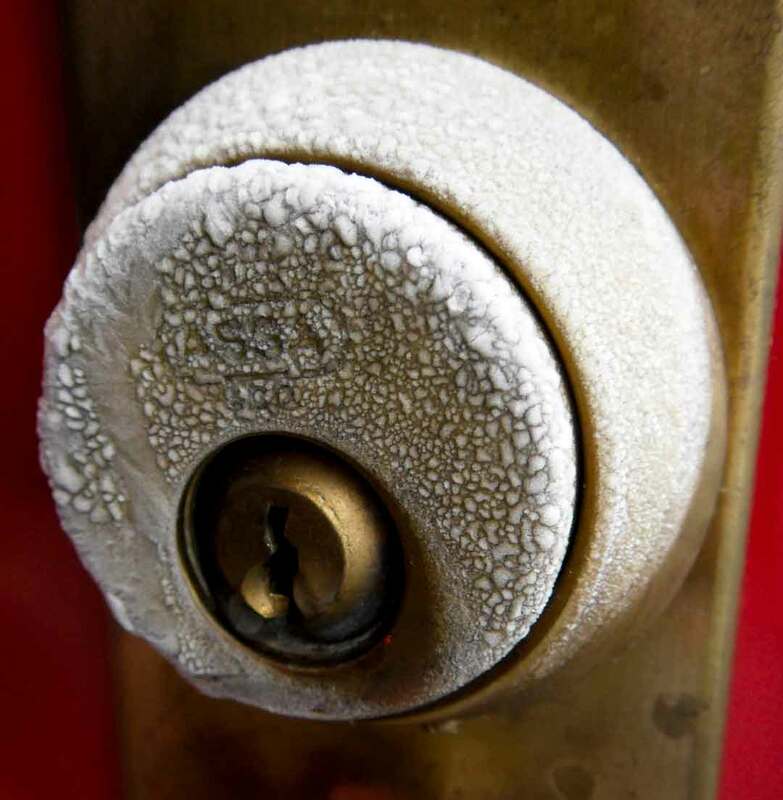 To unfreeze a lock in your door, try heating the key from a cigarette lighter or a candle. If you’re wearing thick gloves, this might be a bit of a hassle. You can also try to use a lock de-icer which is available in a spray can or a small tube. In terms of dirt, you might ultimately have to remove the lock and screws to get inside the mechanisms for cleaning. Dirt and even oil from fingers can build up over time and freeze inside of the locking system---lovely, right? Once the lock is removed, you can wash it out with mild dish detergent and water. Be sure out the lock with a hairdryer so it doesn’t freeze! Now that you know the 9 common winter weather woes for entry doors, there comes a time when trying to fix a tired old door just isn’t worth it. But when should you worry about replacing a door in the dark, cold days of winter? While some homeowners are under the impression that you don’t install new doors in the winter, nothing is further from the truth! In fact, the winter season is a great time to get that old and outdated door replaced once and for all. Even though you can apply some of these remedies for fixing common winter weather problems, there comes a time when replacement is in order. Here’s how to know when it’s time! Your door is old. The truth is, modern doors provide extra technologies to reduce energy loss and keep the home comfortable. Old doors show their true age the most during the winter months when air infiltration becomes most obvious---think in terms of drafts and overall discomfort in your living space. The door is damaged. For example, winter moisture damage can easily cause old wood doors to peel or even rot. This is way more than a cosmetic issue! Your home is losing energy, even after you try fixing the door. If you manage to stop your entry door from squeaking, this doesn’t make it more energy efficient. Even new weather stripping can only provide so much assistance in terms of energy conservation. You’ll need a new door with an internal foam core and professional installation for best results. Don’t forget that you can often get a better deal on new entry doors when you opt for winter installation. Why? Supply and demand! Many homeowners are waiting until spring to get started on exterior remodeling projects, which can lead them to paying more money and waiting longer for installation day to arrive. In the wintertime, you’ll get your door installed faster---you can often pick and choose your installation date! How’s that for convenience? From financial incentives to energy savings, you’ll find countless benefits to replacing your entry door in the winter. If your door is worn and losing energy from your home, contact Universal Windows Direct to discuss more options for a better quality door that stands the test of time.